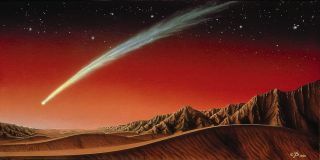 This illustration of a bright comet over Mars was created by artist Kim Poor. As 2013 draws to a close, it's time to look forward to the stargazing highlights of the coming year. Here are 11 of the most noteworthy skywatching events that will take place in 2014. SPACE.com's Night Sky column will provide more extensive coverage of these events as they draw closer. The asteroid in question is 163 Erigone, and the star that it will obscure is Regulus, in the constellation of Leo, the Lion. Along a 45-mile-wide (72 kilometers) path, the asteroid’s shadow will move on a southeast-to-northwest trajectory and will extend from New York City to Oswego in New York State and continue northwest into Ontario, Canada. Those who are watching at just the right moment (no telescope or binoculars necessary) will see an amazing sight: Regulus will seem to abruptly disappear as if a switch had been thrown. Regulus will remain invisible for up to 12 seconds (for those situated along the center of the path) — an incredible, albeit very brief occurrence. During the overnight hours, it will be a night first for Mars and later for the full moon. Mars will come to within 57.4 million miles (92.4 million km) of our planet, making its closest approach to Earth since January 2008. All through the night, Mars will resemble a dazzling star shining with a steady fiery-colored tint; its brightness will match Sirius, the most luminous of all the stars. As a bonus, later that very same night (actually the early hours of April 15), North America will have a ringside seat to a total lunar eclipse when the full moon becomes transformed into a mottled reddish ball for 78 minutes as it is completely immersed in the shadow of the Earth. This total lunar eclipse will be the first one widely visible from North America in nearly 3.5 years. The Americas will have the best view of this eclipse, although over Canada's Maritime provinces, moonset will intervene near the end of totality. Of special interest is the fact that the moon will appear quite near to the bright star Spica, in the constellation Virgo, during the eclipse. The moon and Spica actually will be in conjunction a couple of hours prior to the onset of totality, but they're still relatively near to each other when the eclipse gets underway. Astronomer Jay Pasachoff sent in this photo on May 10, 2013 capturing the annular solar eclipse at the moment of the "ring of fire.” He took the image from a site 43 miles (70 km) north of Tennant Creek, Northern Territories, Australia using a Nikon D600 FX and a 4000-mm Nikkor lens with a Thousand Oaks Optical filter. April 28-29: A "Ring of Fire" Eclipse that Nobody Will See? It is quite possible that only penguins will witness the annular (ring) phase of this eclipse, as it will occur within the uninhabited region of Wilkes Land in Antarctica. A partial solar eclipse will be visible from Australia. Because the axis of the moon's antumbral shadow misses the Earth and only its edge grazes Antarctica, it makes an accurate prediction of the duration of annularity all but impossible. This unusual cosmic interaction might result in an amazing, albeit brief, display of meteors, popularly known as "shooting stars." There could be many dozens, or even hundreds, of meteors per hour, experts say. This eclipse favors the western half of North America, the Hawaiian Islands, eastern Asia, Indonesia, New Zealand and the eastern half of Australia. Across central and eastern North America, the moon will set while still completely immersed in Earth's shadow. The moon will pass to the north of the center of the shadow, with totality lasting one hour. As a consequence, we might expect a relatively bright eclipse, possibly featuring a coppery red hue across the lower part of the moon, contrasted by a brighter upper rim. Interestingly, during the total phase, binoculars and telescopes will reveal a sixth-magnitude greenish point of light in the vicinity of the darkened moon: the planet Uranus. In fact, from central and northern Alaska and northern Canada, the moon will actually occult (hide) Uranus during totality — a very rare event! All eyes will be on the Red Planet in October as Comet C/2013 A1(Siding Spring), discovered by Robert H. McNaught at Australia's Siding Spring Observatory, will pass extremely close to Mars. The comet will come so close, in fact, that its coma may envelop Mars, as well as create a stupendous shower of meteors as seen from the Martian surface. The moon's penumbral shadow will fall over much of North America as well as extreme eastern Siberia, producing a partial solar eclipse. Greatest eclipse, with more than four-fifths of the sun's diameter covered by the moon, will occur in M'Clintock Channel, an arm of the Arctic Ocean which divides Victoria Island from Prince of Wales Island in the Territory of Nunavut, Canada. The rest of North America will see less of the sun covered. For the Pacific Northwest and the Northern Plains, more than 60 percent of the sun’s diameter will be eclipsed. Across the Ohio, Tennessee and Mississippi valleys, maximum eclipse will coincide with sunset, while farther to the east, the moon will only begin its encroachment onto the sun's disk as it sets. Astrophotographer Adrian Kingsley-Hughes provided a composite image of Geminid meteors taken Dec. 13, 2013.